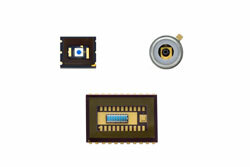 First Sensor: With the Series 9, First Sensor offers a wide range of silicon avalanche photodiodes (APDs) with very high sensitivity in the near infrared (NIR) wavelength range, especially at 905 nm. With their internal gain mechanism, large dynamic range and fast rise time the APDs are ideal for LIDAR systems for optical distance measurement and object recognition according to the time of flight method. Application examples include driver assistance systems, drones, safety laser scanners, 3D-mapping and robotics.